Ages 4 through 9. This CD includes reproducible picture scenes and activity worksheets that you can use to teach spatial concepts that are commonly encountered in the classroom and in everyday social contexts. The worksheets are great for children with communication disorders who need help with basic concepts such as on, in, under, behind, between, beside, over, near, far, top, and bottom. The picture scenes are entertaining and FUN for children. 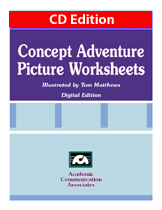 This digital product includes reproducible full-page Concept adventure Picture Scenes and Concept Adventure Story Worksheets. A reproducible basic concepts worksheet is also included. The Concept Adventure Picture Scenes each depict a situation in which animals, insects, and other nouns are shown in a variety of locations. These scenes can be used to facilitate the comprehension and expressive use of basic spatial concepts. They also can be used to stimulate the development of story telling skills. You may reproduce the pictures for use with your students at school or at home. The digital file makes in easy to print out the reproducible pages when you need them. Just select the worksheets that you need and print them out from your printer. Note: This product is also available in a downloadable format. See RELATED PRODUCTS link below.